There has been lots of chatter about wallpaper and wall murals over here lately and for good reason. There are just so many amazing and gorgeous designs to choose from—overwhelming, I know! I regularly get emails from customers asking if they should wallpaper just an accent wall or the entire room. I think both options can work, it just depends on the wallpaper pattern, the size of the room, and what other patterns will be going on in the room. When choosing to wallpaper a whole room, choose a pattern that’s not TOO crazy. Don’t get me wrong, you can have fun here, but think of it like a tattoo—even if you love it when it’s brand new, will you love it in 5 years? Granted, wallpaper is easier to remove than a tattoo (arguably), but you get the idea. I’ve found a couple of examples where whole-room wallpaper looks amazing and doesn’t overwhelm the space. This nursery was such a treat to design and I love the effect the whole-room wallpaper has here. When I met with my client about this nursery, she really wanted it to have a serene feel. The mellow and sophisticated, neutral tone, and subtle hand drawn print allowed for us to wallpaper the whole room while keeping that calm and serene vibe. You can read more about how we chose this wallpaper and see some of the other options we were considering. Here is another (totally different) example for how amazing whole-room wallpaper can look! I love the pattern and it really works in this room because the rest of the space is balanced and the ceiling is bright. 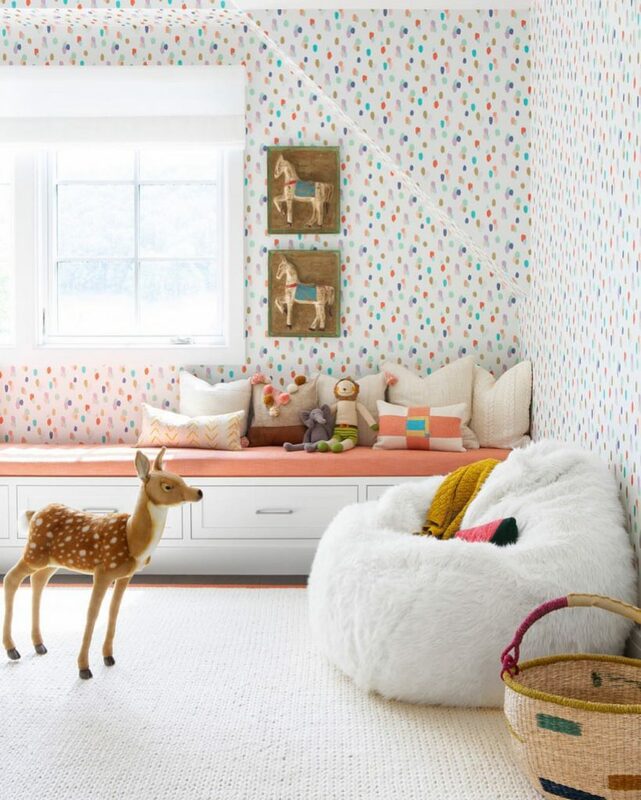 The painted dots wallpaper pattern in the image above is bright and fun, but it’s not overwhelming. The space also has a nice natural light, which helps the space feel larger, more open and allows for a bolder color palette or pattern. If you are looking for longevity in wallpaper design and creating a room with the ability to grow with the child, a more subtle wallpaper usually wins. It will simply be easier to update decor pieces and furniture in a space with a more subtle pattern. One of the super fun parts about my job is when I get to check in on clients and help them transition a nursery to a toddler space, create a dedicated playroom as child grows, or even design a space suited for older kids—and that is much easier to do if the wallpaper is more neutral and sophisticated. Maybe you’ve hit a wall (pun intended) trying to decide on wallpapering an accent wall or the whole room. Step in your room, get a feel for the space and light during the day, and go with your gut!